As you do not work with various languages, you can choose to hide the EN icon for language switching that wastes space in the taskbar. You would like to make space for more useful things. The EN icon in the taskbar allows quick switchovers of input language and keyboard layout. If you can do without this function, then you should not only hide the icon but also deactivate this function yourself. Otherwise an unintentional keyboard shortcut could cause a language change in Windows, resulting in major inconvenience and confusion. It is especially irritating if you don’t know what’s gone wrong and your typing is suddenly filled with errors. First click on the ‘EN’ icon in the taskbar with the right mouse button and select the context command ‘Settings’. In Vista/7 change to the ‘Updated keyboard settings’ section. Mark the entry ‘Advanced key settings’ in the area and then click on ‘change key sequence’. Change other options respectively to ‘not assigned’ and confirm it with ‘OK’. Under XP click in the area ‘Regional and Language Settings’ in the ‘Keyboard’ section, mark the entry ‘Input languages’ and click on ‘change key sequence’. Now deactivate the options ‘change input area scheme’ and ‘change keyboard layout’ and confirm it twice with ‘OK’. Then change to the register ‘language bar’ and change the option on ‘hide’. 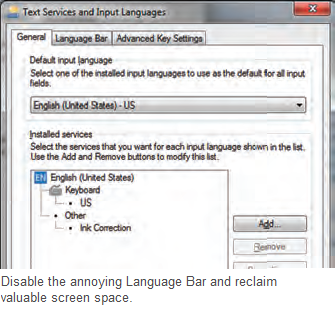 If you do not work with various languages, then you can remove the unwanted languages from the system as well. Thus the language bar also vanishes automatically from the taskbar. In the same dialog box, change to the section ‘General’ or ‘Settings’ under XP. Click in the lower area on the non required languages. A click on ‘Remove’ deletes this language from the system. Later you can ‘Add’ more languages using the same settings, though you might need to insert your setup DVD.